Alex Theoharides (@Minne_Pop) takes a look like what chances the Minnesota Timberwolves have to land a solid, starting shooting guard to add to their young core. The Wolves are only two games out of the eighth and final playoff spot (John Hollinger’s playoff odds have them at 51.6%), which would be an impressive accomplishment for a team that has floundered near the bottom of the standings ever since they traded KG to Boston. The first step for a young team is putting together a strong enough regular season to squeak its way into the postseason. In 2010, both the Oklahoma City Thunder and the Chicago Bulls grabbed the 8-seed in their respective conferences; this year both teams are favorites to reach the NBA finals. For a young team, making the playoffs is an indication that players are learning to win games as a unit. The NBA is all about consistency. This season in particular is jam-packed with back-to-back games and tricky travel plans. Every team has talented players who can go off on any given night; however, learning to win “ugly” games is the difference between a team like San Antonio Spurs that makes the playoffs every year and teams like the Golden State Warriors or Wolves that play entertaining games, but rarely win. The Wolves biggest need is a reliable shooting guard—made particularly notable last Sunday against the Lakers when Luke Ridnour spent major minutes guarding Metta World Peace. Currently, Rick Adelman is starting two points guards (Rubio and Ridnour) alongside Wes Johnson at the wing position. He’s also giving shooting guard minutes to Wayne Ellington, and the newly returned from injury Martel “Look at My Hair” Webster. Once J.J Barea returns from injury he will also warrant serious playing time. While all of these players have promising skill sets, the problem is that none of them has been consistently reliable. Wes Johnson is a long and athletic player who should create match up problems for opposing guards. However, he’s shooting an abysmal 36% from the field—a stat made worse because teams have stopped running out cover him, which has effectively made it increasingly difficult for his teammates to score while he’s on the floor. Wayne Ellington has shown flashes of talent this season, but at best he is a 7th or 8th man. Meanwhile both J.J. Barea and Martel Webster have been injured for most of the season, so it’s been difficult to judge how well they’ll fit in when on the court with Love and Rubio. Best Deal: A three-team trade involving Minnesota, Dallas and Orlando. The Wolves would get Beaubois as well as Brandon Haywood’s fat contract, Dallas would get Dwight Howard, and Orlando would wind-up with Jason Terry, Michael Beasley, and Wes Johnson. Possible/No Chance in Hell Analysis: The only team that would agree to this deal is Dallas because they would end up with Dwight Howard. Minnesota would never agree to it because Roddy Beaubois is an injury prone, undersized guard who has the same basic skill set as J.J. Barea. Orlando would also nix the deal—they can get much more than Terry, Beasley and Johnson for Howard. Final verdict: No Chance in Hell. Best Deal: A three-team trade involving Minnesota, Houston, and the L.A. Lakers. Minnesota gets Kevin Martin, Houston gets their long sought after Pau Gasol, and the Lakers get Kyle Lowry, Hasheem Thabeet, Derrick Williams, and Luke Ridnour. Possible/No Chance in Hell Analysis: The Lakers and the Wolves would possibly make this deal. Kevin Martin would give Minnesota a sharpshooting two guard, who would help stretch the floor for Kevin Love and Ricky Rubio. By obtaining Lowry, the Lakers would fill their biggest need—a quick, effective point guard. The Rockets, however, would most likely not make this deal. Although in Gasol, they would obtain the big man they’ve been seeking ever since Yao Ming retired, they would have to give up their two best offensive players to obtain him. Best Deal: A two-team trade between Minnesota and Dallas. The Wolves get Jason Terry, the Mavericks get (not sure that’s the right word) Michael Beasley and Darko Milicic. Possible/No Chance in Hell Analysis: Minnesota would be stupid not to make this deal. Beasley is (at best) an inconsistent headache, and Darko has already been replaced in the Wolves lineup by his best friend on the team, Nikola Pekovic. The only reason Dallas would make this trade is if their owner was a power obsessed lunatic. Who’s their owner again? Oh, that’s right—Mark Cuban. Best Deal: By far my favorite trade on this list: a four-team trade involving Minnesota, Boston, Phoenix and Orlando. The Wolves get Allen, the Celtics get Dwight Howard and Steve Nash, the Magic get Rajon Rondo, Michael Beasley and Jermaine O’Neal, and the Suns get Wes Johnson and Luke Ridnour. 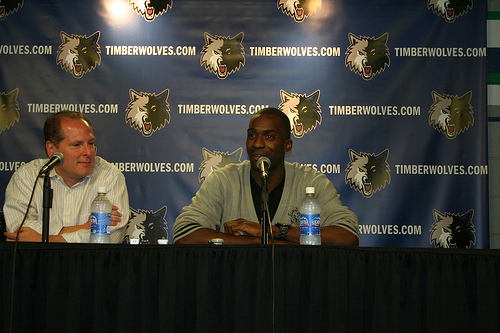 Impact (according to Hollinger): MN +5 wins, BOS +9 wins, PHO -8 wins, ORL - 3 wins. Possible/No Chance in Hell Analysis: The Wolves, Magic and Celtics would all make this trade (a big if, the Wolves would need some assurance they could sign Allen to a two-year deal). This trade would save Steve Nash’s career from desert oblivion, resurrect the Celtics title hopes, give the Wolves the veteran two-guard they need to reach the postseason, and provide Orlando with a young player to build their future around. Phoenix is the wild card. They don’t get much in return for Nash. However, it’s doubtful that anyone will give them too much for Nash (he’s just too old). They’d only complete this deal if they were willing to deal with he wrath of their fans and to commit fully to rebuilding their team through the draft. Best Deal: A three-team trade involving Minnesota, Orlando, and Phoenix. The Wolves get Redick as well as point/shooting guard Chris Duhon, The Magic get Steve Nash, and the Suns get Micheal Beasley, Wes Johnson and a giant migraine. Possible/No Chance in Hell Analysis: Orlando would (and should try to) make this deal. Anyone who reads this and loves basketball should tweet #freestevenash every second of everyday for the rest of their lives. Okay, maybe I’m overstating things. Still, I feel like I’ve been robbed of one of my favorite all time basketball players simply because the Suns team is terribly constructed. Orlando would be a perfect fit for Nash. God, Steve Nash has made the Polish Hammer, Marcin Gortat into a borderline All Star this season, just imagine what he would do for Dwight Howard’s game. Minnesota would be somewhat less likely to make this trade. J.J. Redick would give the Wolves the consistent outside threat they need; however, he is a very limited defensive player. The only ways the Suns make this deal is if Nash asks to be traded. Even than, they might balk at the combined headache of Beasley and Johnson. Best Deal: A three-team trade involving Minnesota, Memphis, and Phoenix. The Wolves get Mayo as well as center Mareese Speights, the Grizzlies get Steve Nash, and the Suns get Darrell Arthur, Wes Johnson, and Anthony Randolph. Possible/No Chance in Hell Analysis: The Wolves would probably make this trade. If you remember, they traded O.J Mayo during the 2008 NBA draft to get Kevin Love. Clearly, they won that deal. This season Love has become nothing short of a superstar, while Mayo remains a talented enigma—just as capable of scoring 30 points as he of disappearing for major stretches of a game. The one factor they’d have to consider is whether or not Mayo would fit in with their young, hardworking nucleus. I don’t think he would. I also don’t think he’d embrace or be embraced by the Wolves’ fans. Memphis would also probably make this trade. The acquisition of Steve Nash would immediately bolster their point guard position, while also increasing their ticket revenue. Phoenix would only make this deal if Nash agreed to be traded, and if they couldn’t get anything better for him. They are fading from playoff contention and are closing in on a full scale rebuilding effort. This trade would give them a more flexible and younger roster. Best Deal: A three-team trade involving Minnesota, Indiana, and Phoenix. The Wolves get George Hill, Indiana gets Steve Nash, and Phoenix gets Wes Johnson and Darren Collison. Possible/No Chance in Hell Analysis: The Wolves would get a proven two guard, the Pacers get an NBA icon who could help transform their promising roster to the third best team in the Eastern Conference, and Phoenix would get younger and more athletic. Both the Pacers and the Timberwolves would gladly make this deal. The Suns, again, would have to see if Nash wanted to get traded. If he did, Collison and Johnson would only be a decent return for Nash. Best Deal: A two-team trade between Minnesota and Philadelphia. The Wolves get Turner, the 76ers get Anthony Randolph and Wes Johnson. Possible/No Chance in Hell Analysis: Minnesota would leap at the opportunity to unload two young, promising but under-performing players for one young, somewhat less under-performing player. Philadelphia would not make this deal. None of these trades dramatically improves the Wolves’ roster. If I were David Kahn I take elocution lessons so that I stopped sounding like a jackass. Then I’d wait to see if Martel Webster or J.J. Barea could fill the Wolves’ void at the shooting guard. Webster is particularly interesting. At 6’7” he is a match up nightmare for other two guards. He plays hard, aggressive defensive, and he’s shown some ability to make open shots. If he could put together consistent performance, the Wolves might just have a team worth keeping together.